I know the weather’s starting to warm up but near the end of winter, I get in as many soup and stew days as possible. Once the spring and summer hit, my cravings will turn from warm homey dishes to fresh, light dishes like salads, sushi and grilled veggies. 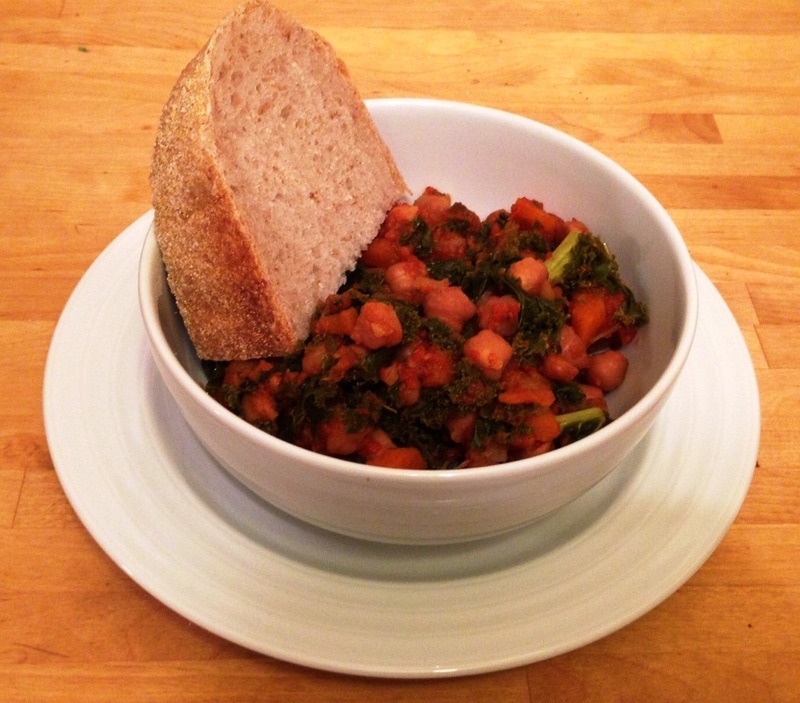 I went with the basics–root veggies, canned tomatoes, rich greens and a tad of spice. 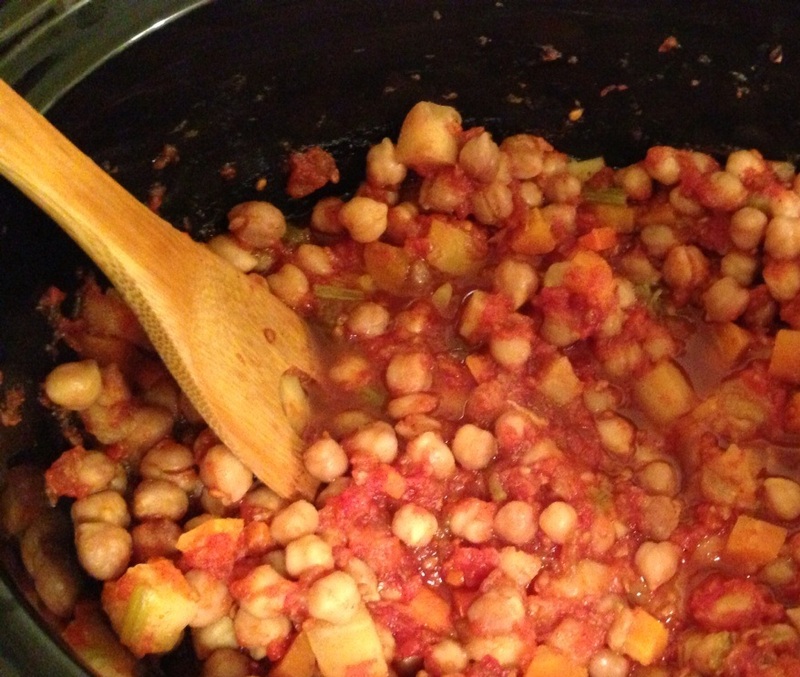 I had seen a number of chickpea recipes with garam masala. because it’s a spice I use far too infrequently, I figured, let’s toss that in too. Toss that all in a crockpot, set it, come home after work and you have a hearty meal all ready to devour. 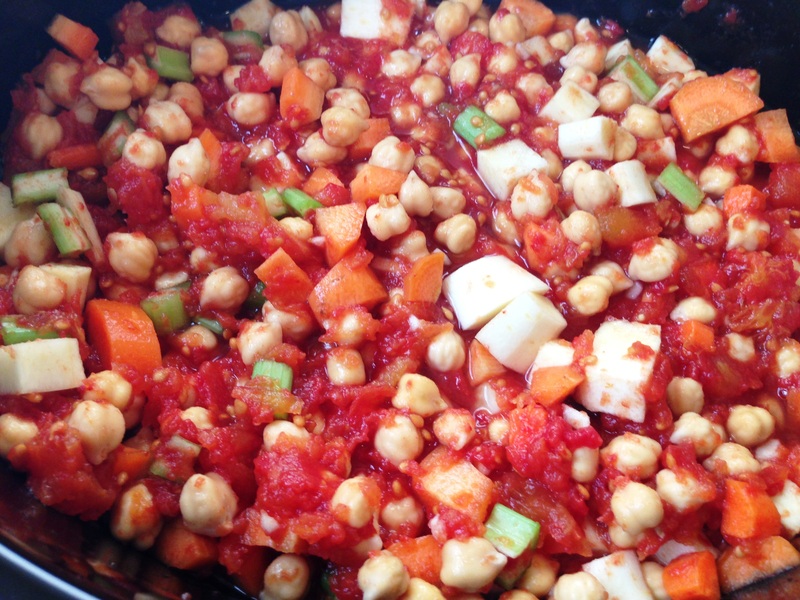 Drain chickpeas and dump into slow cooker. 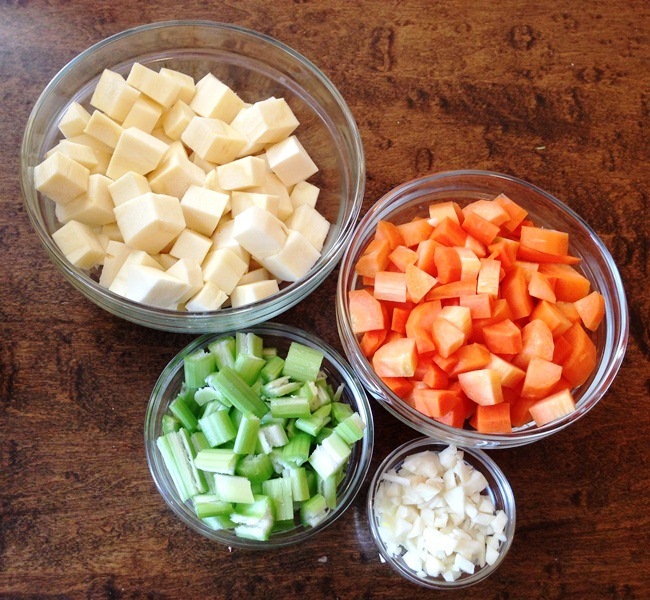 Add carrots, celery, parsnip and garlic. Mix well. Add whole tomatoes, one by one, crushing them with your hand. Add remaining juices plus water to make 1 cup of liquid. Add red pepper and garam masala and mix well. Cover and set your slow cooker to 10 hours on low. Note: you want to add the salt (and pepper) AFTER the stew is cooked. 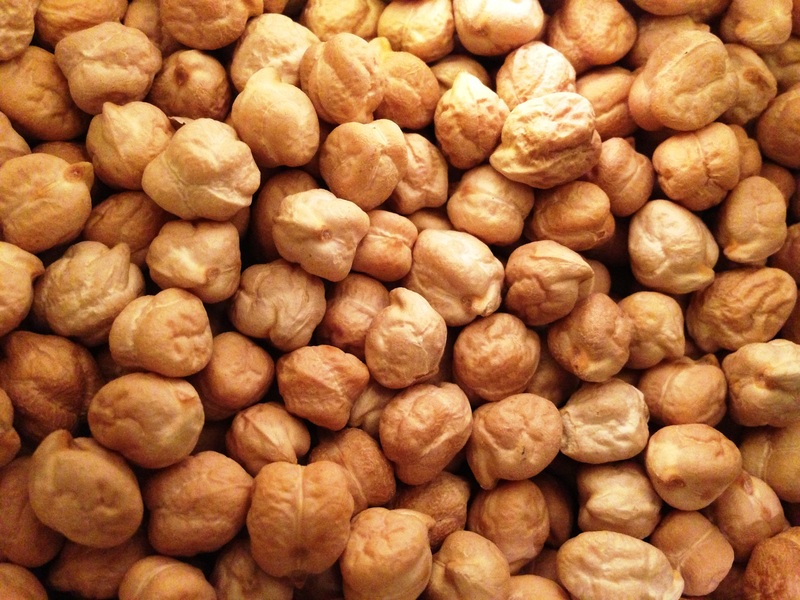 Salt often slows the beans from cooking, resulting in crunchy, rather than soft chickpeas. Season stew with salt and pepper to taste. 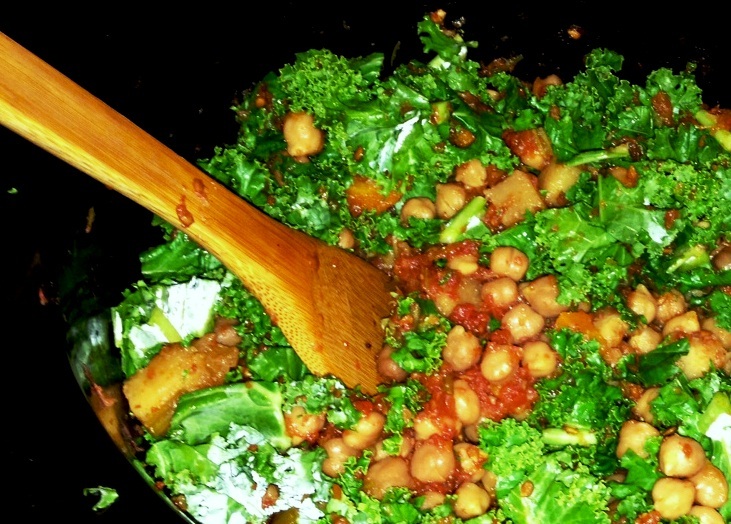 Stir in sliced kale and cook for an additional 30 minutes on high or until kale is tender. Serve with a hearty slice of bread and enjoy! I never knew that salt slowed the beans from cooking. Great tip. Thanks. Yeah, I think I l read it after I had cooked some other recipes. 3 hours of cooking black beans and couldn’t figure out why they were still hard as a rock. I usually cook my beans all day in the slow cooker and hardly salt anything. Maybe I just never noticed, haha. I use chick peas often, though mine are almost always canned. They’re great tossed into “kitchen sink one pot dishes,” to add cheap bulk to your meal. I love roasted them too! This stew looks delicious. If I’m using canned beans, should I rinse them and use 2 cans instead of 2 cups dried? I’ve tossed them in other stews, dishes, but this was the first “feature” ingredient one. Yes, I would use two cans. Dried beans generally double (or a little more than) after soaking. You probably wouldn’t need as much liquid either because the beans wouldn’t be soaking up as much. Maybe 1/2 cup, just to cover the bottom of the stoneware.